Located between Los Angeles and San Francisco, Pinnacles National Park is a little-known geological wonder comprised of massive monoliths, cliffs, rock spires and, boulder-covered caves. The rock formations are actually part of the remains of an ancient volcano, the rest of which was moved about 195 miles to the southeast by the San Andreas Fault. Within the monument are picnic grounds, caves, numerous hiking trails and, for those lucky enough, sights of the endangered California condor. While the environment high above is dry and hot, the cooler canyon floor is home to over 100 species of wildflowers, streams teeming with life, and ancient oak trees. 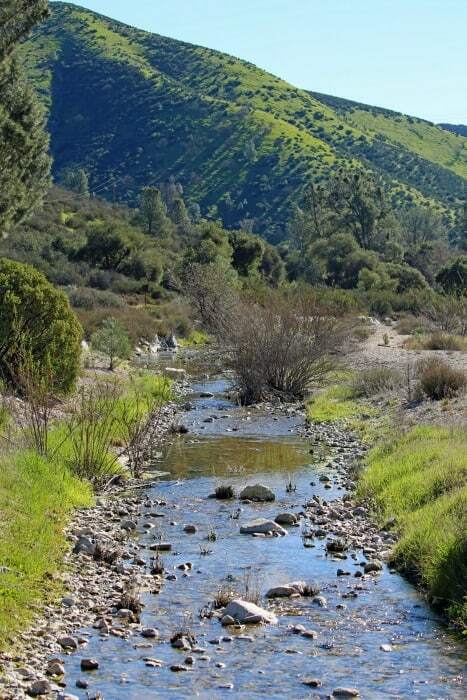 The park protects a mountainous area located east of the Salinas Valley in Central California , about 5 miles from Soledad, California and about 87 miles southeast of the town of San José. The name of the park refers to the eroded mountains, remnants of the western portion of an extinct volcano that moved about 215 miles from its original position on the San Andreas fault rooted in a sector of the Pacific coastal chain in California. The Pinnacles National Monument was created in 1908 by President Theodore Roosevelt. 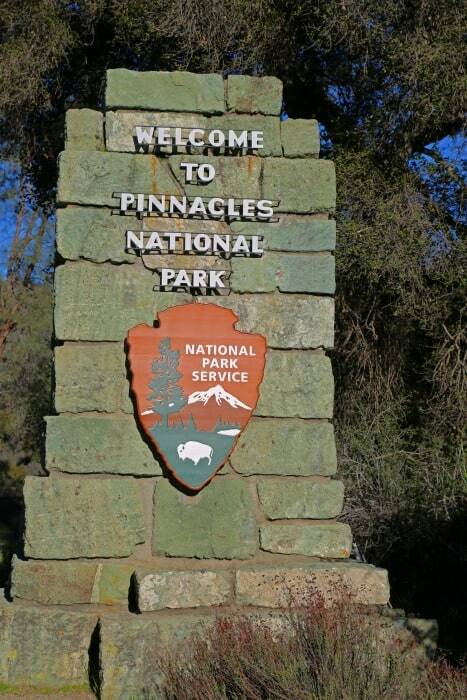 The Pinnacles National Park was created from the grounds of the Pinnacles National Monument through legislation passed by Congress in 2012, this law being promulgated by President Barack Obama in January 2013. The national park is divided into sectors an east and west one, by rock formations, both being interconnected by pedestrian paths. The east portion has shade and water, while the west is characterized by its high rock walls. The rock formations are high and attract numerous climbers. The park has several caves that serve as a home for more than thirteen species of bats. Because of the intense summer heat, visitors prefer to visit Pinnacles during spring or autumn. Numerous Cooper’s hawks dwell in the park, and California condors have been released within it, that had been bred in captivity. Pinnacles is a nesting area and one of the few release sites in the United States for the endangered California condor. These massive birds can weigh about 20 pounds and have wingspans of nine feet. The sight of a California condor soaring above the multicolored cliffs and peaks is enough to make even the hardest trail worth it. Head to the high peaks for the best chance to spot one. Besides the condors, Pinnacles is home to a large population of prairie falcons, Golden Eagles, and American Kestrels. In early 2010, the National Park established a partnership with the Quebrada del Condorito National Park in Argentina, the center for the protection of the Andean Condor. The administrations want to cooperate in matters of birds of prey protection. The bedrock of the mountains consists of Cretaceous granite and granodiorite with an age of approximately 78-100 million years. On it, rises the Pinnacle Volcanic Formation; volcanic rocks (predominantly rhyolite, andesite, and dacite ) from a volcanic activity phase at the beginning of the Miocene about 23 million years ago. The High Peaks, the most distinctive of the area, consist of breccias, volcanic ash and lava flows . The cracks in the rock weathered under the influence of the strong temperature fluctuations to today’s distinctive shapes. Among the erosion geological formations of the area are the rare Talus Caves. These caves were formed by crevices at the foot of the rock formations, on which volcanic talus boulders of varying sizes fell, so that they did not completely fill the cracks, but stuck in the cracks or covered them. The resulting cavities extend up to several hundred meters. The two largest were additionally rinsed out by streams and are accessible from both sides. The National Park is a recreational area for the Greater San Francisco and the coastal region. It attracts free-climbers due to the rugged rocks and their cracks that offer a variety of technically challenging routes, mainly in the difficulty levels 5.6-5.10 according to the Yosemite Decimal System (YDS). To protect the birds of prey during the breeding season some rocks and climbing walls are closed. Many people simply drive to Pinnacles National Park, right off U.S. 101 for the west entrance or Calif. 25 for the east entrance. You’ll be rewarded with some of California’s most stunning scenery without the crowds and high cost. Due to the extreme heat and drought in the summer months, a visit to Pinnacles National Park is only really comfortable in the colder months. The highlight of the season is spring, when the highlands between the rocks are littered with flowering plants.